How Many Times Can a Skunk Spray? 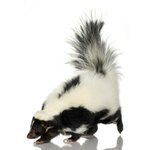 Skunks are perhaps most commonly known for the foul-smelling spray that they eject when they feel threatened or frightened. They are common across North America and the smell from their spray is notoriously hard to remove. Skunks are a member of the weasel family and they can vary in size and pattern. Most skunks are about the size of a domestic cat and can have striped, spotted or swirled patterns; however, all skunks are black and white. Skunks most often nest in burrows and eat fish, insects, fruit and plants, reptiles, worms, larvae, eggs and small mammals. Skunk spray causes no real harm to its victims, but its smell is horrible and it is extremely difficult to remove. The spray is an oily liquid produced by glands underneath the skunk's tail. A skunk's spray can go almost 10 feet and the skunk can spray up to six times in succession. After a full discharge, it can take a skunk up to 10 days to resupply. The old suggestion of bathing in tomato juice or soup to rid yourself of skunk smell does not actually work. Also, spraying yourself with orange citrus, lemon juice or Febreze will not result in the removal of the smell. However, if you mix 1 qt. of hydrogen peroxide, 1/4 cup of baking soda and 1 tsp. of liquid soap or dish detergent and thoroughly shampoo the victim, it will eliminate the smell.